Dealey Plaza is a public park in Dallas, Texas, best known as the location where President John F. Kennedy was assassinated on November 22, 1963, fired on by a sniper from the Texas School Book Depository. A museum focusing on Kennedy and the assassination now occupies the former depository, and there are various remembrances around the plaza. Now a National Historic Landmark District, Dealey Plaza includes several notable sites. The Sixth Floor Museum is located on the upper floors of the former book depository, where evidence of the shooter was discovered. Displays here chronicle Kennedy’s life, presidency, and assassination. A white X on Elm Street marks the spot where the president was shot, and on the northwest side of the plaza is the famed grassy knoll, which played an important role in conspiracy theories about alternate shooters. One block away, you’ll find John F. Kennedy Memorial Plaza. Dealey Plaza is a must for anyone interested in presidential history. Visitors are asked to treat these sites respectfully and with deference to the tragic event that occurred here. Both the Sixth Floor Museum and Dealey Plaza are wheelchair accessible. Dealey Plaza encompasses the intersection of three streets in west downtown Dallas—Main, Elm, and Commerce—bordered by North Houston Street. Interstate 35 East (aka Stemmons Freeway) runs just one-third of a mile west of the plaza, and paid parking is available behind the Sixth Floor Museum. By public transit, take the DART to West End and walk about five minutes to the plaza. 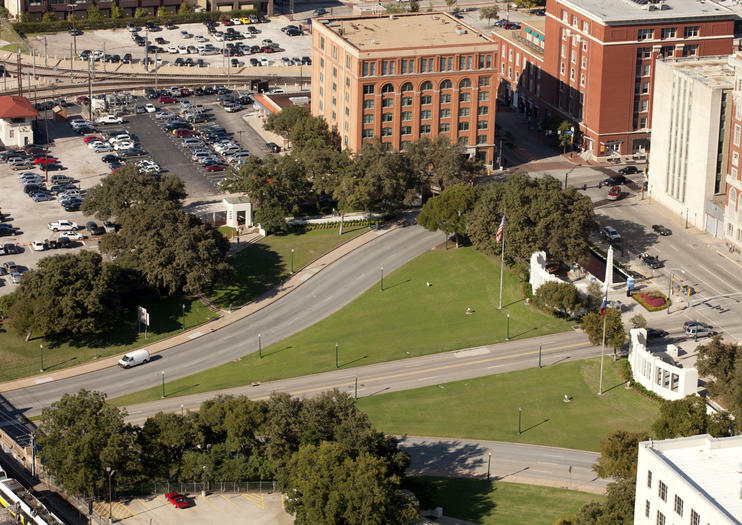 The best time to visit Dealey Plaza is during the week, when the area is less crowded. Spring and fall are ideal times to explore Dallas, before the peak heat of the Texas summer months. Throughout the years, a variety of hand-painted X marks have appeared on Elm Street allegedly denoting the two locations of President Kennedy’s limousine when shots struck him. These are not official markings from the city or any other historical organization. Occasionally, the city removes them, but they always quickly reappear.